Solenoids; Methods and utilities; Online references - Maxwell, Nagaoka, NBS, etc. ; Links. Inductor losses and Q .
Solenoid impedance and Q. Optimising Q. Bibliography and online refs. Transformers and other inductively-coupled devices. 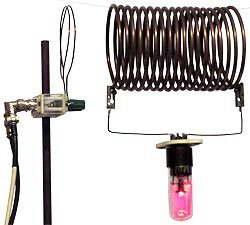 Inductance and loss modelling articles by Alan Payne G3RBJ. Andy Cowley (29th March 1948 - 23rd April 2012, sadly missed) for helpful discussions and for assisting me with references and donations of laboratory equipment. Rodger Rosenbaum for reference materials, critical review, and contributions to be found in the documents above. Bob Weaver for reference materials and contributions, particularly in the discussion of computational methods and for writing an making available many useful functions and algorithms. Dr Mark Kennedy for interesting discussions, critical review, and documents (such as those relating to induction heating) that I would not otherwise have studied. Dr Richard Craven, for introducing me to the work of Peter Vizmuller (inventor of the folded helical resonator). See R M Craven, PhD 2014.